Happy birthday to me! Happy birthday to me! Happy birthday to meeeee, happy birthday to me!!! Today marks the 2nd anniversary of my 29th birthday and the start of my birthday week, and I couldn’t be more excited! And the only reason I am excited is because of this flipping recipe. Ok, maybe not the only reason, but this is by far the best birthday present I have *EVER* given to myself. You want to give me a birthday gift as well by following me on Twitter and Pinterest, liking my Facebook page, and subscribing to my posts?!? Awwww thanks, y’all!!!! You just made my day even more special!!! These gorgeous tasty morsels of funfetti fantasticness are like ittybitty bites of birthday heaven hand delivered to moi by the big man upstairs. And they are only 87 calories and 2 WWpts each!!!! Also, I will never ever, never ever ever make another type of cake icing again. This is the absolute best I’ve ever eaten, and you would never know that it is super low calorie and kinda, sorta, a little bit good for you. IMHO, butter extract makes the world go round. 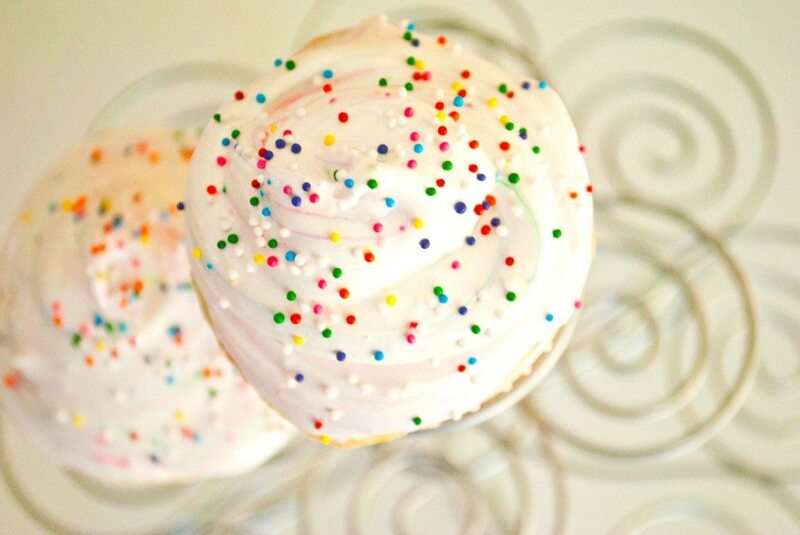 It is that extra special ingredient that makes recipes taste like cake batter without having to actually use cake batter &/or mix. 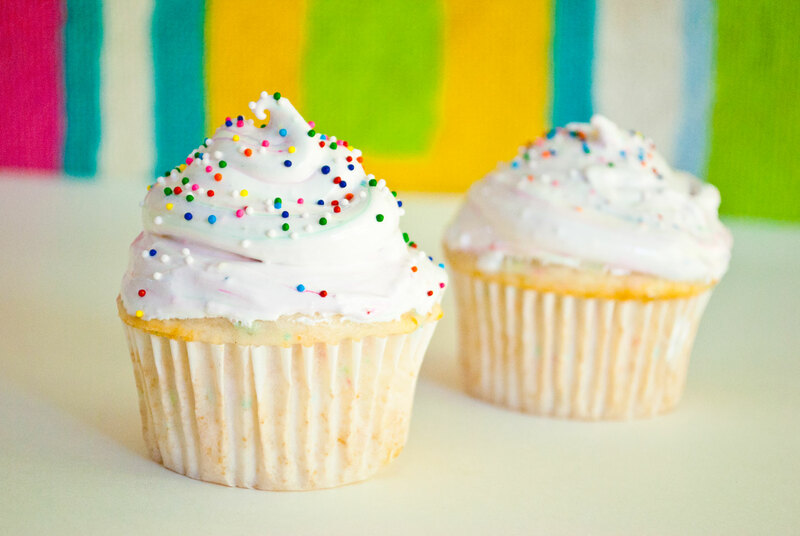 Another great thing about this recipe is that it only makes two cupcakes. Hallelujah praise the Lord because if y’all are anything like me, you can’t stay away from cupcakes if they are anywhere within your vicinity. Also, I promise you will never miss the eggs, butter, and oil that are missing from this cake. The only wet ingredient you will need is a bit of flavored soda water of your choosing and you are good to go! (No soda water? Use diet sprite or cream soda instead). 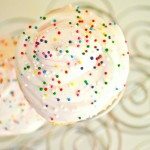 My sweet tooth is horrible and unrelenting, but because of this awesome recipe, I have finally found the perfect way to have my cake and eat it…for two! Mix cake mix and soda water until well blended. 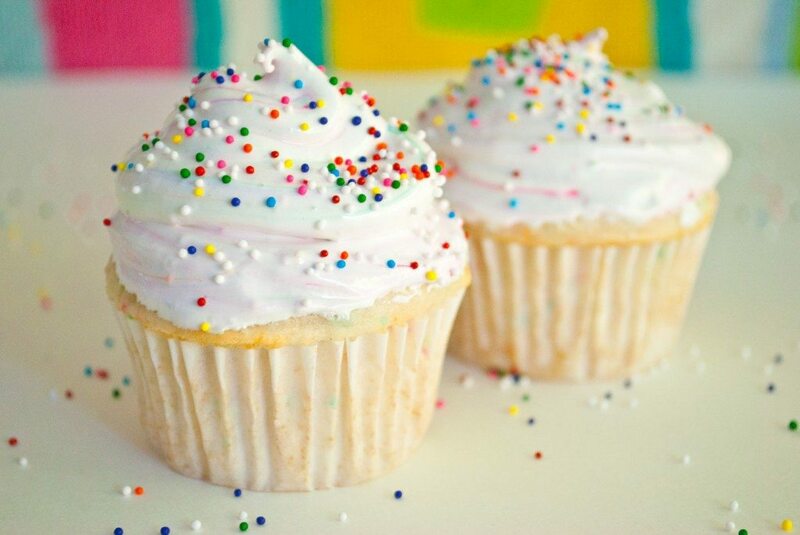 Pour batter into two lined cups of a large cupcake pan. Pour water into a small pot and place on stove over medium-low heat. Combine egg white and sugar in a medium glass bowl and place over the water, creating a double boiler. Constantly whisk the egg mixture over the simmering water until the sugar is dissolved and the mixture is warm to the touch, about 5 minutes. Remove from heat and add to the bowl of a stand mixer beating on high for 2 mins. (Just use regular beaters if you don't have a mixer). Add extracts and continue beating for another minute or two or until mixture is light and fluffy and resembles marshmallow fluff. Refrigerate until ready to frost cupcakes. Using a piping bag or a small ziplock bag, pipe the icing onto the cooled cake. Chocolate for sure. Tea (unless I have a lot of studying or science to do…then I’ll go for a coffee or a diet coke). I’m a libra! You’re a scientist?!? What do you do? I wish I like math and science. I don’t…at all. In fact, I couldn’t loathe them any more! I told a friend just yesterday that I would rather right a 25 page paper than take one chemistry test! Ha! 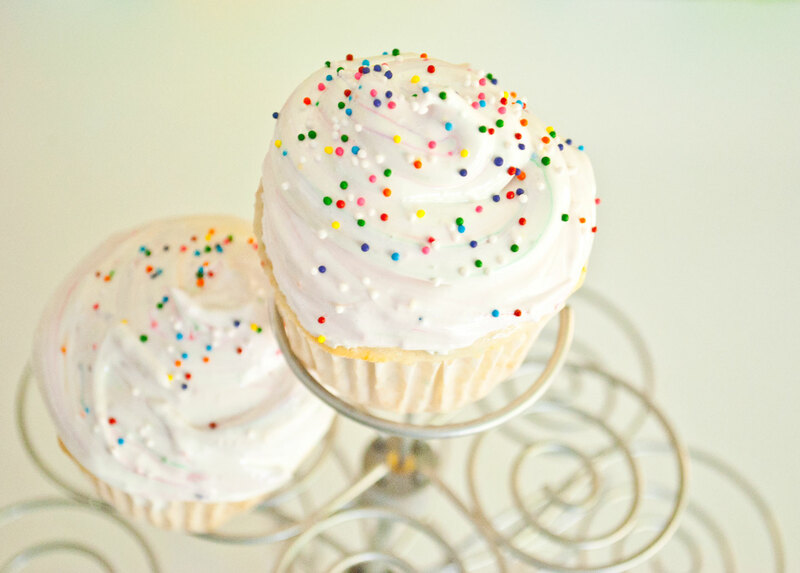 Oh WOW you are my new hero–delicious, SKINNY cupcakes, and the perfect portion size? BRAVO. Thanks so much! They really are the perfect cupcakes. I’m so glad they only make two! I would be in trouble if I made more! Butter extract?? Now that’s a new one for me! But these cupcakes truly look amazing. I am very impressed. And happy birthday to you!!!! Butter extract is da bomb!!! If you haven’t tried it yet, do it! It’s so good and tastes just like cake. Weird, but true! Can you use a low calorie soda such as Sprite zero in place of the soda water? 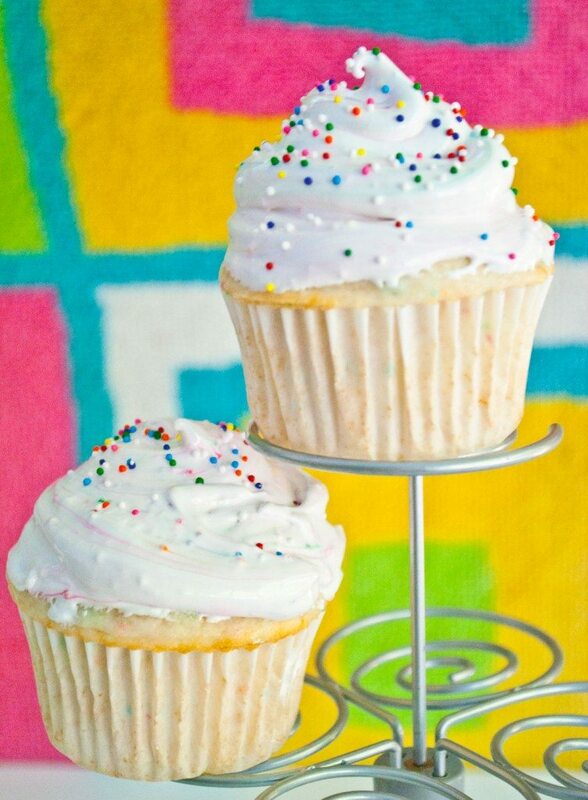 I need this recipe using the whole box of cake mix and how to make enough icing for 24 cupcakes! I want to make these for my daughters birthday party! Hi Cindy! Use one standard box of cake mix and one standard size size can of diet sprite or cream soda (12 Oz, I think?) for the frosting If you just want a little bit use 4 large egg whites, 1 cup granulated sugar, 1 tiny pinch of salt, 1/2 tsp vanilla extract and half a tsp of butter extract and follow the directions on my site. If you want a lot of frosting, double those measurements. Hope this helps! Let me know how they turn out!